The small town of Ajmer, 400 kilometers south/west of Delhi, is unremarkable to the eye at first glance. However, on closer inspection, one beholds the reason that it stands out; pilgrims. In thousands upon thousands they come, Muslim, Hindu, Buddhist, Parses, Christians of all nationalities and backgrounds; raising their voices in celebration and prayer, visit one of the greatest saints ever produced in the long and illustrious history of Islam. The deservedly titled Sultan-ul-Hind (Authority of India),the Qutb or spiritual axis of the eastern Islamic world; he is the fountain from whose spiritual light have sprung all the beautiful, great Mystics of the Chishtiyia silsila. The chief and founder of the Chishtiyia silsila in India, one of the four great orders that radiate throughout the world, Khwaja Gharib Nawaz (RA) is one of the most respected and universally recognized figures in Sufi Islam. He stands tall as a great spiritual leader; a reformer and purifier of hearts at the most turbulent of times. Most of the mystics before his time had been concentrated around the lands of the Middle East, but he was a pioneer, a missionary who was responsible for spreading love, peace and equality thru Islamic missionary works to the remotest regions of caste ridden India. His pious character was a true picture of Islam; his practice exactly in accordance with the dictates of the Holy Qur'an and Sunnah, and his teachings beautiful lessons in godliness, truthfulness, and equality which enlightened the hearts of multitudes. Authentic estimates place the number of people he guided to the path of Islam at nine million. It is a historical fact that his Chishtyia silsila wielded a direct and crucial influence on the course of Indian history. Khwaja Moinuddin Chishty (RA) was born in the year 536(Hijra) in Sijistan, the son of Khwaja Ghyasuddin, a pious and influential man of what is now Iran. He was a direct descendant through both his parents of Hazrat Ali (AS). It was a time of chaos and great upheavals in both India and the Muslim World as a whole. In the year of his birth, Sultan Sanjar was finally defeated before the implacable advance of the Mongols, spelling the beginning of the end of the Sultanate; and in Khurasan, where he was brought up, religious sects and barbarism had laid waste, a once civilized country. He was orphaned at the tender age of fourteen. But social evils, moral degradations and personal tragedy stirred something deep within the young man, and he began to turn towards spiritual life. Once when watering his father's garden, he came across a dervish, Hazrat Ibrahim Qanduzi (RA). He was deeply affected by the mystics’ holy manner, and Hazrat Ibrahim (RA) on his part transformed Khwaja Moinuddin Chishty (RA)'s inner being. His eyes opened to the ultimate realities of the spiritual world. Renouncing all material things, he sold his father's garden, all his possessions and distributed the money among the poor. Still at a young age, he arrived at the great centers of learning in Samarkand and Bokhara, where he became a hafiz (learning the Quran by heart) and distinguished alim, fully conversant in all aspects of Islamic thought. Unsatisfied with this, he began a strict regime of prayers, meditations, fasting and self-renunciation which continued for years and grew more intense and vigorous. At this point, he felt the need for a Sheikh (Master), or spiritual guide, feeling the truth of the Qur'anic injunction, O ye who believe! Be mindful of your duty towards Allah, and seek a means of approach unto Him, and strive in his way in order that ye may succeed. (5:35). He himself used to state, "success is not possible without a guide." He travelled extensively throughout the near East, finally finding a spiritual guide in Hazrat Khwaja Uthman Haruni (RA). In twenty years he spent under his Sheikh/Murshid's guidance, he attained perfection in tasawwuf (Mysticism) and was awarded the Khilafat (successor) by Khwaja Uthman (RA). He offered many pilgrimages both with his Murshid and alone. It was during one of these, while in Medina AlMunawara, that he was directed spiritually by Prophet Muhammad (sallalahu alaihi wasallam)) to go to Bilad AlHind (India) and teach the message of Islam. He left immediately with 40 of his disciples, on the long and arduous journey. Along the way, he stopped in several places including Baghdad, Isfahan and Balkh. In Baghdad Sharif, he was the guest of Sheikh Abdul Qadir Jilani (RA), the greatest of saints and founder of the Qadriyya silsila. Hazrat Ghaus-ul Azam (Ra) organized a qawwali in his own house for the visitors, and he himself stood outside that night, with eyes closed and his staff tightly held against the ground. When asked the reason for his actions, he replied, "I needed to stop the ground shaking, such was the power of Khwaja’s wajd." It was because of his of humble obedience that Allah granted him the title, "Sultan-e-Hind", for he is the leader and spiritual head to all the hundreds of walis that have blessed India in after-times. Khwaja Moinuddin Chishty (RA) arrived in India at a time of tremendous upheaval and moral decay. The Ghaznavi dynasty was in its death throes and tyrannical rulers were making life unbearable for common people. Yet India is not named for no reason, "the land of saints and Sufis"; its people had inherited a wealth of spirituality that yearned for expression. It was into such an arena that Khwaja Moinuddin Chishty (RA) stepped, a torch to India's tinder. First he went to Lahore, a centre of learning where a great number of Muslim theologians, philosophers and sufis resided. Yet he soon left this place, for his divinely guided mission was not to men such as these, but rather to those who were deprived of the light of Islamic message of love, peace and equality. Thus he arrived in Delhi, which was to become the seat of his most famous successors. At the time, the city was a place of much fear and mutual hatred between Hindus and Muslims, but Khwaja Moinuddin Chishty (RA) began delivering his sermons in a soft tongue, dipped in honey. As a result of this kindness and forbearance, both Hindus and Muslims were turned towards the path of truth. The great WaliAllah (friend of GOD) was revered and loved by those of both religions, a trend which, was to be the hallmark of Sufism in India. Soon, however, he left Delhi too, heading instead for the remote city of Ajmer, deep within the kingdom of the most powerful Rajput prince in Northern India, Raja Prithviraj Chauhan. This city was completely alien to Islam; no Muslim at all lived within its bounds. It was in this hostile environment that Khwaja Moinuddin Chishty (RA) and his forty disciples settled and began the bulk of his teaching. Very soon, however, he changed the entire civic atmosphere, gathering people of all races, castes and stations to the shining truth of the message of Islam. His high morals and frugal lifestyle deeply impressed the local people and all the while, the beautiful messages of the Qur'an and Sunnah entered deep into their hearts. It is interesting here to note that the raja's mother had predicted the arrival of Khwaja Moinuddin Chishty (RA), and had warned her son not to interfere with him lest he suffer total destruction. Whether Raj Prithviraj forgot this prophecy or ignored it is unknown, but he began to harass the Sheikh and trouble his followers. But Khwaja Moinuddin Chishty (RA), holding firm to the Islamic doctrine that, "Allah is with those who patiently persevere," steadfastly carried on his peaceful mission. One day, however, he said, "the raja will be captured alive, and his kingdom snatched away." This prophecy was proven true not months later. The raja, was defeated by Sultan Shahabuddin Ghori, was captured alive and brought into the presence of the sultan, who ordered him executed. 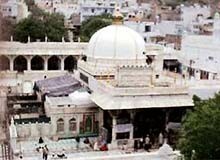 Khwaja Moinuddin Chishty (RA) carried on his work in Ajmer for 45 years, and millions entered Islam through his spiritual light and endeavors. Besides this great service, he also established permanent Sufi centers which were run by such mighty spiritual descendents as Khwaja Qutubudin Khaki, Hazrat Nizamudin Aulia, Hazrat Baba Farid Ganj Shakar and Khwaja Nasiruddin Chiragh Delhi (RAs). Such was the passing of one of the greatest saints in Islamic history. One can only imagine the hardship he endured in his early years in Ajmer, in the kingdom of a hostile king, surrounded by a people even whose native tongue – Prakrit/Pali - was foreign to him. His life is a miracle in itself. He not only moulded the character of a people, but also led them to a more prosperous, nobler way of living, and cultivated in them the qualities of humanity and truth. Through him and his immediate successors, the entire culture and civilization of India underwent a profound change. People of all religions, caste and creed are continuously receiving material as well as spiritual favors from him when they visit his shrine. As is stated in Sura al-Nasr, When Allah's succor and triumph cometh, and thou seest mankind entering the religion of Allah in troops, then hymn the praises of thy Lord, and seek forgiveness of Him Lo! He is ever ready to show mercy.